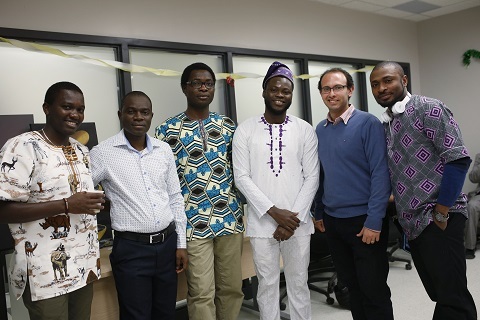 On March 17, TIM Africa celebrated the entrepreneurial initiatives that students and recent graduates of Carleton University’s Technology Innovation Management (TIM) program who were born in six African countries are carrying out in Ottawa. The Ottawa Business Journal, Carleton Newsroom and The Finder have published articles on the event. Many TIM students are launching companies while completing their degrees. Afolabi Adare and Akinlolu Oluwoye launched Innovers to reduce the cost of purchasing energy by transforming human vibrations into energy to power buildings such as hockey arenas. Tamunoiyowuna Apiafi and Mobolaji Ojo launched Insight Lenz, a venture that uses technology to scan a person’s eyes for the purpose of identifying medical illnesses. Justice Akligo launched CardsAfric to deploy solutions currently available at Canadian post-secondary institutions in Africa. Esther Anegbe's Tech Wits provides information and communication technology services to Canadian startups and their accelerators and incubators. Maged Makramalla launched Game it! to leverage the use of gamification to solve real world problems. Ace’s Cuisine, owned by Amarachukwu Oguegbu, provides bulk-cooking services to African students and young professionals. Faith Ben Edo-Osagie's Fastcash is a venture that is developing a highly secured mobile software to simplify how money is sent and received internationally. Jane Otu launched E-Shopper to develop and market an application that enables users to conveniently purchase groceries from any store and have it delivered to them within a geographical area. Mackenzie Adams launched a consulting company, SOLANA. Recent TIM graduates are growing the companies they launched as graduate students. Adefemi Debo-Omidokun (M.A.Sc. TIM, 2012) founded Emrads Inc. to help remotely located patients access professional and trustworthy pharmacy services and pharmacists to grow their revenue. Syncrodata, a company owned by Alem Legesse (M.Eng. TIM, 2013), develops and markets TrendifyLive, software that enables customers to collect intelligence/ sentiments live from social media and increase their return on investment. Olufemi Olawale (M.A.Sc. TIM, 2012) owns an engineering company, Zapot Technologies, that provides close circuit security surveillance systems in Nigeria. Kevin Muita (M.Eng. TIM, 2014) is working to start and grow a revolutionary technology start-up in Canada. Judith Iriele is completing a project to help her family’s business adopt new processes to improve customer retention and exploit new revenue opportunities. Adelakun Ademola Adegbemiro’s project is developing automated transport systems designed to replace the manual payment systems that allow corrupt drivers to cheat. Olukayode Adegboyega is completing his M.A.Sc. thesis. His research focuses on using the theory of club goods to examine cyber-attacks as collective actions of individuals and organizations linked on the Internet. TIM graduates born in Africa also find employment in organizations that link Ottawa to African countries. Uruemu Agwae (M.Eng. TIM, 2014) works for the Nigeria High Commission.